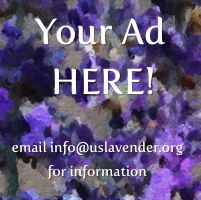 To support and promote the United States lavender industry through research, education, networking and marketing. marketing information and opportunities for you and the industry as a whole. As a collective voice for members, the United States Lavender Growers Association will advocate for, promote, and support and United States lavender industry. The USLGA will offer opportunities for members to participate in and benefit from networking, education and research. It will seek marketing opportunities to raise awareness of the lavender industry, connect buyers to sellers, and enhance member farms and businesses. The USLGA will support growers in producing a quality sustainable lavender crop and end products to satisfy U.S. demand and will be a partner in the global lavender community.